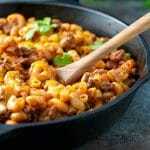 A comforting, cozy and delicious hamburger helper that's not only much healthier and tastier than store bought but requires hardly any effort at all. Brown ground beef in a skillet over medium-high heat until no longer pink. Drain off the fat, and add remaining ingredients to the skillet. Stir to combine, bring to a boil, and simmer uncovered for about 15 minutes (or until it reaches your desired thickness). Season with salt and pepper to taste; garnish with cheese and parsley, if desired.